France is a country located in Western Europe. Clockwise from the north, France borders Belgium and Luxembourg to the northeast, Germany and Switzerland to the east, Italy to the south-east, and Spain to the south-west, across the Pyrenees mountain range (the small country of Andorra lies in between the two countries). The Mediterranean Sea lies to the south of France, with the Principality of Monaco forming a small enclave. To the west, France has a long Atlantic Ocean coastline, while to the north one finds the English Channel, across which lies the last of France's neighbours, England (part of the United Kingdom). The country is divided into 22 administrative regions, which can be grouped into 7 main "cultural regions" that share common points. 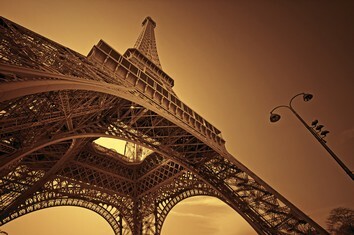 France is the world's most popular tourist destination as it has numerous cities and towns of interest to travelers. The country boasts dozens of major tourist attractions – Paris, the Côte d'Azur (the French Riviera), the Atlantic beaches, the winter sport resorts of the Alps, the Castles of the Loire Valley, Brittany, Normandy, and Mont Saint Michel. The country is renowned for its gastronomy (particularly wines and cheeses), history, culture, and fashion. French; in Brittany, the recognised regional langauge, Breton (Gaelic) is also used. There’s more to France than its delicious stinky cheeses and smooth regional wines! Whether in Paris or Lyon, Nantes or Marseilles, shop for scarves, stationary, fabrics, perfumes, lingerie, handmade glass objects. In the north, look for Quimper Pottery (Brittany), hand-knit fisherman's sweaters; and be sure to sample cider (cidre brut) along with buckwheat crepes with various fillings, both savory and sweet, and finish your meal with calvados (Normandy). While in Provence, Santons (small hand-painted porcelain figurines, usually religious in nature) are popular with tourists as souvenirs. Paris receives the most tourists in the world. The north and northwest have a temperate climate, while a combination of maritime influences, latitude and altitude produce a varied climate in the rest of Metropolitan France. In the south-east a Mediterranean climate prevails. In the west, the climate is predominantly oceanic with a high level of rainfall, mild winters and cool to warm summers. Inland the climate becomes more continental with hot, stormy summers, colder winters and less rain. Chateau de Versailles is an estate located in France. Popularly called Versailles, it is basically a royal chateau, where King Louis XIV lived with his wife. When the palace was built, Versailles was a country village. However, with time, it has now grown into a suburb of Paris. The Eiffel Tower was built for the 1889 World Fair which also coincided with the centenary of the French Revolution. Out of a number of designs submitted as part of a competition, Alexandre Gustave Eiffel won, and was responsible for erecting the Eiffel Tower. The Parc de la Villette is a unique area of culture and leisure in Paris. Offering a wide variety of exhibitions and shows, this cultural crossroads is also a lovely park, with gardens surrounding the Ourcq canal. La cité des Sciences et de l'Industrie is located at the top of the park, and is a masterwork of modern architecture. This original-style theme park, open from April to November, was developed around the theme of Asterix and Obelix, long ago heroes of Gaul. Since 2001 the park has included some impressive and even terrifying rides among the 28 in all and one of Europe's eight biggest rollercoasters. Centre Georges Pompidou is a complex in the Beaubourg area of the 4th arrondissement of Paris, near Les Halles, rue Montorgueil and the Marais. It was designed in the style of high-tech architecture. It houses the Bibliothèque publique d'information, a vast public library which is the largest museum for modern art in Europe. The Musée d'Orsay is a museum housed in a grand railway station built in 1900. Home to many sculptures and impressionist paintings, it has become one of Paris's most popular museums. When it opened the museum contained some 2300 paintings, 1500 sculptures and 1000 other objects. In the middle of the Place Charles de Gaulle, at the border of the 8th, 16th and 17th arrondissement stands one of the greatest arches in history. The arch was commissioned by Napoleon in 1806 to commemorate his victories, but he was ousted before the arch was completed. The Louvre, originally a palace but now one of the largest and most visited museums in the world, is a must-visit for anyone with a slight interest in art. Some of the museum's most famous works of art are the Mona Lisa and the Venus of Milo. Located just outside Poitiers in western France, Planete Futuroscope is a giant 53 hectare-theme park with a difference. With 3-D cinemas, giant screens and interactive attractions, the park offers visitors numerous exhibits and shows using the latest audio-visual technologies. The Disneyland Paris, known as Parc Disneyland in France, is one the finest amusement parks in the world. Located at Marne-la-Vallée, Disneyland Paris is Disney's first European venture. Spread over an area of over 5, 000 acres, the Disneyland Paris is a complete family vacation destination offering its visitors world-class rides and other adventures.